No news on Final Fantasy VII Remake as it shifts to internal production. The latest issue of Weekly Famitsu has an interview with Kingdom Hearts III and Final Fantasy VII Remake director Tetsuya Nomura, who shares new information on the former while briefly discussing the latter. 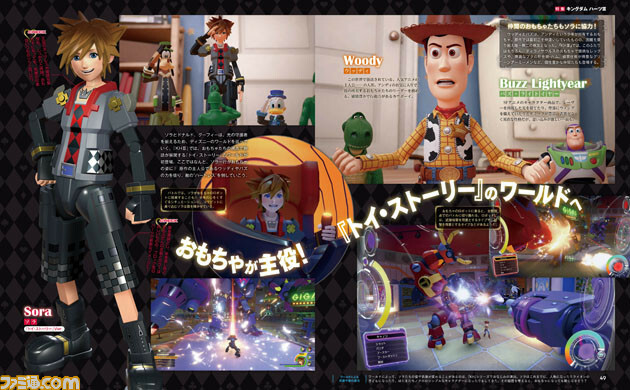 Nomura wanted a Toy Story world in Kingdom Hearts since around Kingdom Hearts II. For Kingdom Hearts III, there have been repeated negotiations as its inclusion was of absolute necessity. While it is not shown in the trailer, at the start Sora is mistaken for a character in the latest game to be released in this world. The Toy Story staff were considerably surprised at the reproduction quality of the Toy Story characters in-game. Nomura told the development team he wanted riding and fighting in a mech early in development. A different mechanism is being prepared for when you go to another floor in Galaxy Toys. The Big Hero Six world is progressing well, but news on that is still down the line. While the number of Disney worlds are less than the amount included in Kingdom Hearts II, the density of each world is greater, including gameplay. Final Fantasy VII Remake and Misc. If you missed it, catch the Toy Story world reveal trailer for Kingdom Hearts III here. The game will launch for PlayStation 4 and Xbox One in 2018. Thanks, Famitsu, Hachima Kikou, and Ryokutya2089.